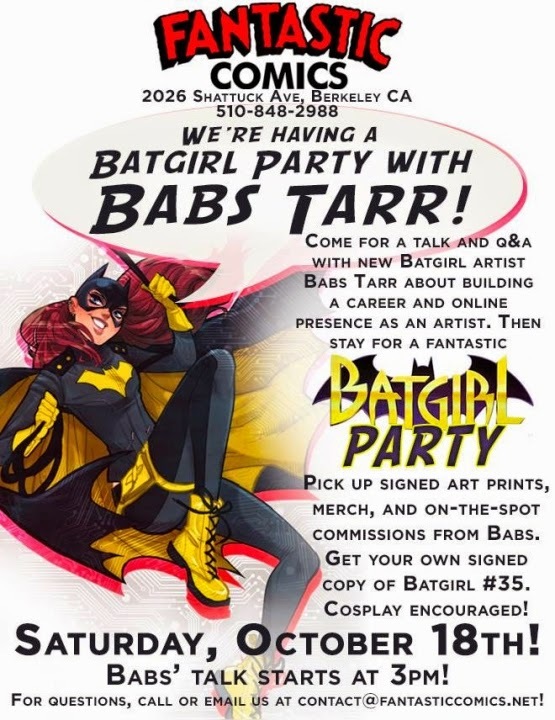 Over at the FANTASTIC COMICS Comic Book Shop in Berkeley, California they are having a BATGIRL PARTY With BABS TARR on Oct 18th! Babs Tarr is the Official Comic Book Artist for the New 52, DC Comics title, BATGIRL and she will be at the event signing Books, Art Prints, Posters and Current Copies of BATGIRL #35. She will also be doing special "on the spot" art commissions, so you can get some original BATGIRL art too! The BATGIRL PARTY starts at 3:00 PM on Saturday, October 18th. For more store event info just CLICK HERE!